Not too many years ago, the annual “Irrigation Festival” where I live in Washington state celebrated its 100th year. It is touted as the longest running continuous community celebration in our state, and we celebrated along with our neighbors. And when I grew up in Alaska, my family made the annual trek to Seward for the July 4th Mount Marathon footrace, in the midst of Independence Day revelry. I like community celebrations with some history. So when my friend Cesare invited us to Pacentro (a place whose castle towers would have been reason enough) for their annual celebration which included a footrace, we were happy to go. 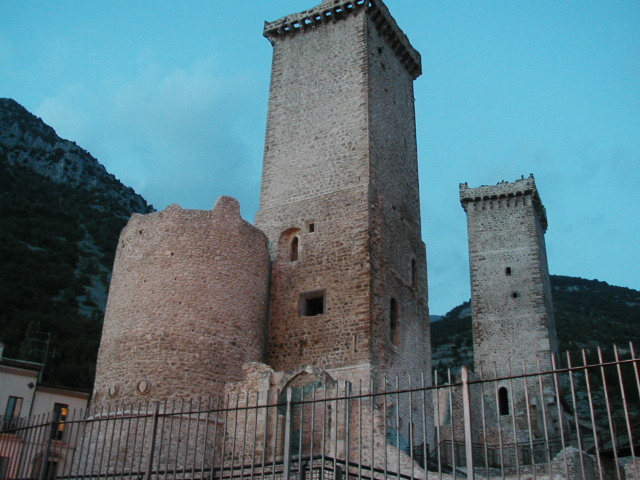 Pacentro is perched on the east side of the wide valley wall south of Sulmona in the central Apennines. We drove up the stony ridge, already crowded with cars, and squeezed into one of his typical, impossible, parking spots. By this point in our travels, I had been immersed in Italian for about a month, and understood more and more of the conversation around me. Cesare and his wife led us to a street overlooking the valley to the south. On the opposite hillside, a large Italian flag appeared to be spray painted on a large rock, marking the start of the race course. 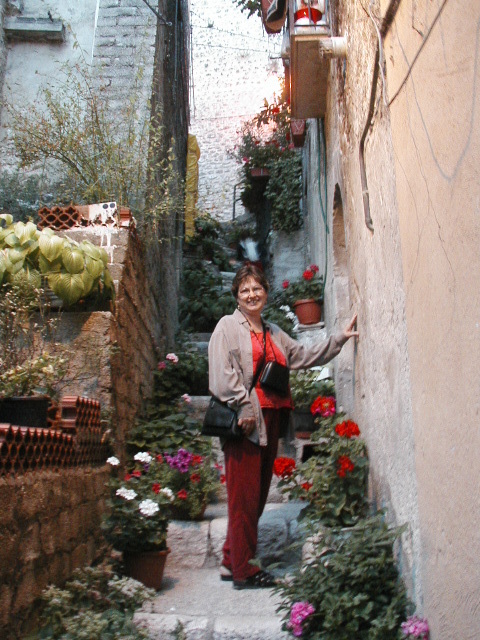 An alleyway in Pacentro, filled with flowers. A public address system, strung up to a high eave, broadcast tinny announcements that could be heard for several blocks. As the racers climbed the hill to the starting line, Cesare told about the origins of the race, when gypsies camped outside the city saw an enemy approaching, and ran barefoot down the hill, across the valley, and up to the hilltop town of Pacentro to warn them, allowing the town to fend off the danger. 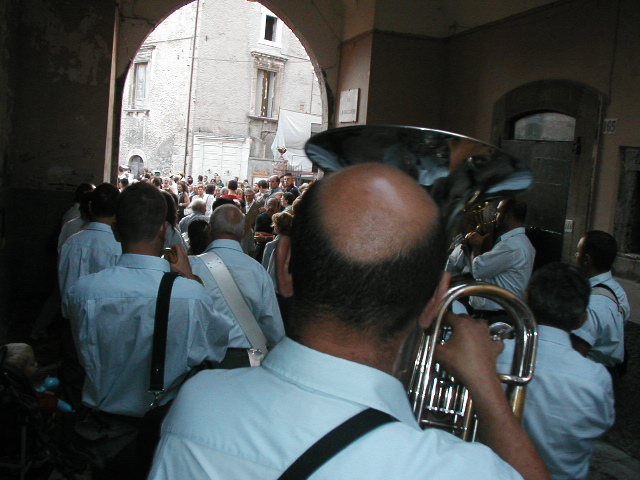 In honor of the “Zingari”, or Gypsies, who saved Pacentro, the annual Corsa degli Zingari, (Race of the Gypsies), is celebrated every year. It has become a coming-of-age ritual for the young men of Pacentro. The prize seems odd–a bolt of cloth. But this was the fabric used to make his first suit of clothes as a man, and young men still compete vigorously for the title, running barefoot across the rough terrain. A band greets the runners. As the two or three dozen racers got in place, fireworks echoed in the valley, and the noisy crowd grew around us. I struggled to hear the announcements, and to understand them. But I was sure I had misunderstood when the announcer welcomed everyone to the 556th running of the Corso degli Zingari. Wait… 556th? That puts it back into the early 1400s. Really? Yes, Cesare assured me, I had heard him correctly. I was still absorbing the historical shock when the ringing of bells signaled the start of the race. We watched them run down the rocky, forested hillside, disappearing into the pines, and reappearing to the cheers of viewers around us. By the time they begin to arrive in the town, within fifteen or twenty minutes as I recall, they are blistered and sometimes bloody. From the finish line, racers are paraded through the narrow crowded streets on the shoulders of their friends. We stayed for a while, walking through the narrow, medieval streets and admiring the towers before heading back to Sulmona as the sun set . My sense of history had been properly tweaked, a reset button in my brain changing just a little bit how I viewed the “longstanding” Irrigation Festival (only 117 years old this year) and the Mount Marathon race in Seward (where they wear shoes, for Pete’s sake!). To see a glimpse of Pacentro and the race, here’s a video from 2009. If you plan to be in Italy in September, you might enjoy attending this very much off-the-beaten-track event. 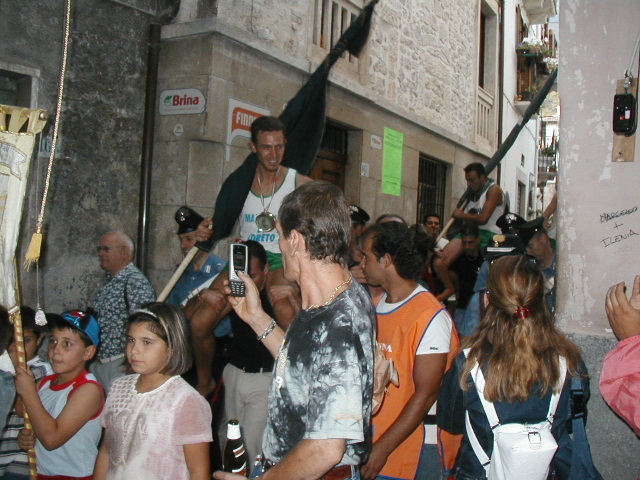 This entry was posted in History, Travel and tagged Abruzzo, barefoot race, Corsa degli Zingari, history, Italy, Pacentro, Race of the Gypsies, travel. Bookmark the permalink.